For the 1983 album, see Ryuichi Sakamoto discography. Coda is a rarities compilation album by the English rock band Led Zeppelin. The album is a collection of unused tracks from various sessions during Led Zeppelin's twelve-year career. It was released in 1982, two years after the group had officially disbanded following the death of drummer John Bonham. The word coda, meaning a passage that ends a musical piece following the main body, was therefore chosen as the title. The fifth Swan Song Records album for the band, Coda was released to honour contractual commitments to Atlantic Records and also to cover tax demands on previous monies earned. It cleared away nearly all of the leftover tracks from the various studio sessions of the 1960s and 1970s. The album was a collection of eight tracks spanning the length of Zeppelin's twelve-year history. Atlantic counted the release as a studio album, as Swan Song had owed the label a final studio album from the band. According to Martin Popoff, "there's conjecture that Jimmy [Page] called 'We're Gonna Groove' a studio track and 'I Can't Quit You Baby' a rehearsal track because Swan Song owed Atlantic one more studio album specifically." 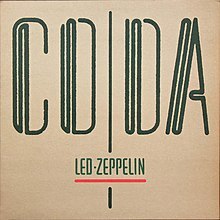 Guitarist Jimmy Page explained that part of the reasoning for the album's release related to the popularity of unofficial Led Zeppelin recordings which continued to be circulated by fans: "Coda was released, basically, because there was so much bootleg stuff out. We thought, "Well, if there's that much interest, then we may as well put the rest of our studio stuff out". As John Paul Jones recalled: "They were good tracks. A lot of it was recorded around the time punk was really happening... basically there wasn't a lot of Zeppelin tracks that didn't go out. We used everything. "We're Gonna Groove" opens the album and, according to the album notes, was recorded at Morgan Studios in June 1969. It was later acknowledged to have come from a January 1970 concert at the Royal Albert Hall, with the guitar parts overdubbed and the original guitar part removed—this can be heard in the original Royal Albert Hall show on 9 January 1970. This song was used to open a number of concerts on their early 1970 tours and was originally intended to be recorded for inclusion in Led Zeppelin II. "I Can't Quit You Baby" is taken from the same concert as "We're Gonna Groove" but was listed as a rehearsal in the original liner notes.} The recording was edited to remove the overall "live" feel: the crowd noise as well as the beginning and ending of the song were deleted. Crowd tracks were muted on the multitrack mixdown on this recording as with "We're Gonna Groove". "Poor Tom" is from sessions for Led Zeppelin III, having been recorded at Olympic Studios in June 1970, and "Walter's Walk" is a leftover from the sessions for Houses of the Holy. Side two consists of three outtakes from the band's previous album, In Through the Out Door. The opening track, the uptempo "Ozone Baby" was recorded at that album's sessions at Polar Studios, Stockholm in November 1978, as was the rock'n'roll styled "Darlene". The third track, "Bonzo's Montreux" was recorded at Mountain Studios, Montreaux, Switzerland in September 1976. It was designed as a Bonham drum showcase, which Page treated with various electronic effects, including a harmonizer. The final track, "Wearing and Tearing" was recorded at Polar in November 1978. It was written as a reaction to punk and show that Led Zeppelin could compete with the new bands. It was planned to be released as a promotional single to the audience at the 1979 Knebworth Festival, headlined by Led Zeppelin, but this was cancelled at the last minute. It was first performed live at the 1990 Silver Clef Awards Festival at Knebworth in 1990 by Plant's band with Page guesting. The 1993 compact disc edition has four additional tracks from the box sets, Led Zeppelin Boxed Set (1990) and Led Zeppelin Boxed Set 2 (1993), the previously unreleased "Travelling Riverside Blues", "White Summer/Black Mountain Side" and the "Immigrant Song" b-side "Hey, Hey, What Can I Do" from the former and the previously unreleased "Baby Come On Home" from the latter. The album cover was designed by Hipgnosis, the fifth album cover the design group designed for Led Zeppelin. It was also the last album cover Hipgnosis designed before disbanding in 1983. The main four letters CODA are from an alphabet typeface design called "Neon" designed by Bernard Allum in 1978. "They really were pretty great, and these eight outtakes—three from their elephantine blues phase, three from their unintentional swan song—aren't where to start discovering why. But despite the calculated clumsiness of the beginnings and the incomplete orchestrations of the end, everything here but the John Bonham Drum Orchestra would convince a disinterested party—a Martian, say. Jimmy Page provides a protean solo on 'I Can't Quit You Baby' and jumbo riffs throughout. According to Julian Marszalek of The Quietus, however, "Coda has always been regarded as the band's weakest release. Made up of eight tracks that spanned Led Zeppelin's lifetime, it refused to flow as an album. Devoid of a coherent narrative, it felt tossed together to make up for contractual obligations." In a retrospective review for AllMusic, Stephen Thomas Erlewine said while it did not compile some notable non-album recordings, it offered "a good snapshot of much of what made Led Zeppelin a great band" and featured mostly "hard-charging rock & roll", including "Ozone Baby", "Darlene", and "Wearing and Tearing": "rockers that alternately cut loose, groove, and menace". A remastered version of Coda, along with Presence and In Through the Out Door were reissued on 31 July 2015. The reissue comes in six formats: a standard CD edition, a deluxe three-CD edition, a standard LP version, a deluxe three-LP version, a super deluxe three-CD plus three-LP version with a hardback book, and as high resolution 96k/24-bit digital downloads. The deluxe and super deluxe editions feature bonus material containing alternative takes and previously unreleased songs, "If It Keeps On Raining", "Sugar Mama", "Four Hands", "St. Tristan's Sword", and "Desire". The reissue was released with an altered colour version of the original album's artwork as its bonus disc's cover. The reissue was met with generally positive reviews. At Metacritic, which assigns a normalized rating out of 100 to reviews from mainstream publications, the album received an average score of 78, based on 8 reviews. In Rolling Stone, David Fricke said it is "the unlikely closing triumph in Page's series of deluxe Zeppelin reissues: a dynamic pocket history in rarities, across three discs with 15 bonus tracks, of his band's epic-blues achievement". Pitchfork journalist Mark Richardson was less impressed by the bonus disc, believing "there is nothing particularly noteworthy about the 'Bombay Orchestra' tracks". All tracks produced by Jimmy Page, except for "Travelling Riverside Blues", produced by John Walters, and "White Summer/Black Mountain Side" produced by Jeff Griffin. Sides one and two were combined as tracks 1–8 on CD reissues. The CD edition with bonus tracks was also included in the career-spanning boxed set Complete Studio Recordings (disc ten), and the subsequent Led Zeppelin Definitive Collection (disc twelve). 4. "Baby Come On Home"
8. "Hey, Hey, What Can I Do"
The CD edition of the album incorrectly lists the running time of "Bring It On Home" (Rough Mix) as 4:19, which is actually the exact time of the finished version listed on Led Zeppelin II. No commercial or promotional singles were issued, although three tracks received independent radio airplay. These songs were Led Zeppelin's debut on the Billboard Mainstream Rock Tracks chart, as the chart did not exist prior to 21 March 1981. ^ a b Popoff, Martin (2018). "Coda". Led Zeppelin: All the Albums, All the Songs, Expanded Edition. Voyageur Press. pp. 224–25. ISBN 0760363773. Retrieved 6 September 2018. ^ Lewis, Dave (2012). Led Zeppelin: From a Whisper to a Scream; The Complete Guide to the Music of Led Zeppelin. Omnibus Press. p. 96. ISBN 978-1-78038-547-1. ^ a b Lewis 1990, p. 61. ^ Priddey 2015, pp. 263–64. ^ Priddey 2015, p. 264. ^ a b c d e Lewis 1990, p. 62. ^ a b c d e Erlewine, Stephen Thomas. Coda – Led Zeppelin at AllMusic. Retrieved 18 May 2012. ^ Batcup, Tim (August 2015). "Led Zeppelin Presence / In Through The Out Door / Coda". Classic Rock. pp. 102–03. ^ Popoff, Martin (1 November 2005). The Collector's Guide to Heavy Metal: Volume 2: The Eighties. Burlington, Ontario, Canada: Collector's Guide Publishing. p. 195. ISBN 978-1-894959-31-5. ^ McCormick, Neil (23 April 2014). "Led Zeppelin's albums ranked from worst to best". The Daily Telegraph. Retrieved 8 December 2014. ^ a b Loder, Kurt (20 January 1983). "Coda". Album Reviews. Rolling Stone. Retrieved 1 January 2012. ^ "Led Zeppelin". rollingstone.com. Archived from the original on 14 January 2011. ^ a b Christgau, Robert (1 March 1983). "Christgau's Consume Guide". The Village Voice. Retrieved 6 September 2018. ^ Marszalek, Julian (28 July 2015). "Led Zeppelin". The Quietus. Retrieved 6 September 2018. ^ a b "Coda [Remastered] – Led Zeppelin". Metacritic. Retrieved 31 July 2015. ^ Anon. (September 2015). "Review". Mojo. p. 98. ^ a b Richardson, Mark (28 July 2015). "Led Zeppelin: Presence / In Through the Out Door / Coda". Pitchfork. Retrieved 31 August 2015. ^ Aizlewood, John (September 2015). "Led Zeppelin Reissues". Q. p. 121. ^ a b Fricke, David (31 July 2015). "Coda (Reissue)". Rolling Stone. Retrieved 6 September 2018. ^ "RPM Albums Chart – 25 December 1982". RPM. Archived from the original on 6 October 2012. Retrieved 19 January 2009. ^ "Top 100 Albums – 1 January 1983". infodisc.fr. Archived from the original on 9 February 2012. Retrieved 19 January 2009. ^ "Top 100 Albums – 18 December 1982". Oricon. Retrieved 19 January 2009. ^ Scapolo, Dean (2007). "Top 50 Albums – December 1982". The Complete New Zealand Music Charts (1st ed.). Wellington: Transpress. ISBN 978-1-877443-00-8. ^ "Top 20 Albums – 28 November 1982". norwegiancharts.com. Archived from the original on 24 October 2012. Retrieved 19 January 2009. ^ "Top 100 Albums – 4 December 1982". chartstats.com. Retrieved 19 January 2009. ^ "Top 100 Albums – December 1982". charts-surfer.de. Archived from the original on 8 January 2009. Retrieved 19 January 2009. ^ "Led Zeppelin - Coda". hitparade.ch. Archived from the original on 16 October 2015. Retrieved 12 August 2015. ^ "British album certifications – Led Zeppelin – Coda". British Phonographic Industry. Select albums in the Format field. Select Silver in the Certification field. Type Coda in the "Search BPI Awards" field and then press Enter. ^ "American album certifications – Led Zeppelin – Coda". Recording Industry Association of America. If necessary, click Advanced, then click Format, then select Album, then click SEARCH. Lewis, Dave (1990). Led Zeppelin : A Celebration. Omnibus Press. ISBN 978-0-711-92416-1. Priddey, Neil (2015). Led Zeppelin: The Complete UK Vinyl Discography. Lulu Press. ISBN 978-1-326-39667-1.